My business philosophy includes multilingualism in its wider sense. My paper designs reflect my love for languages and my belief that language diversity is an extremely important and valuable asset in today's world. This is all done and good. But I also aim to provide a multilingual service. I am a French-native speaker and am fluent in English so can take orders in both of these languages. I am learning German and am trying to converse with customers in that language too. 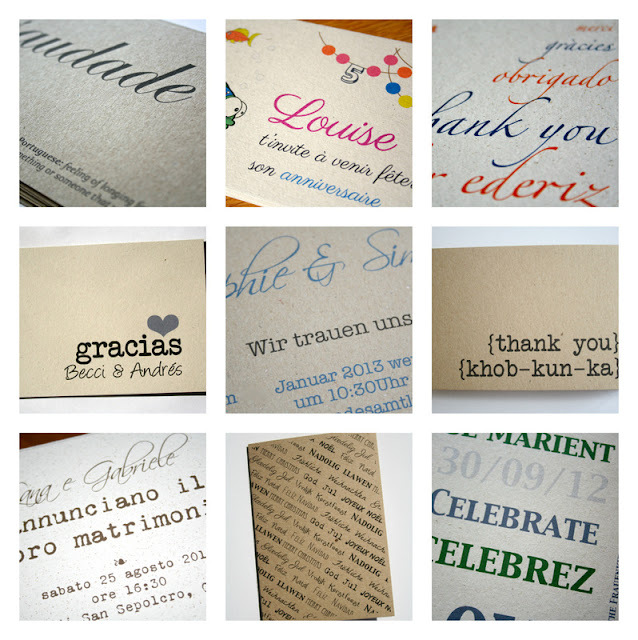 I recently designed and sold wedding invitations for a German couple with only one email exchanged in English! I was quite proud of myself. All of my item descriptions on Etsy are in French and English. I am slowly translating these in German. My business cards are now in these 3 languages. And I also include a little thank you note in every package in one of those languages with a twist! I TRY to use French and English on Facebook and Twitter. My blog is in English and French. I know I still have a way to go.